On Saturday, March 3, I was not home, but in Cambridge MA. I am at Harvard for a two-week stint studying at Harvard Business School. I did not really get a change to get away from the city, but did spend about three hours on Saturday afternoon exploring Cambridge. I met up with a friend of my sister’s and he took me all over Cambridge — from Harvard Yard to Radcliffe to Cambridge Common. We explored buildings and cemetaries as we came across them. The highlight of our wandering was stumbling upon Longfellow House/Washington’s Headquarters. I was surprised to learn that Henry Wadsworth Longfellow had selected the home that George Washington selected as his headquarters and home in July 1775 as he began to build the Continentental Army. The Father of his Country dwelt. Lovely day and a great reminder for this California girl of just how tangible US history in the east. On Saturday, Jeff and I took a day hike on Mt. Tamalpais. It was a great day to try out the Matt Davis-Steep Ravine Loop. Starting at Pantoll Ranger Station, we took the Matt Davis trail over to Stinson Beach (where we had a late lunch) and then took the Dipsea Trail over to the Steep Ravine trail. To say the scenery was beautiful would be an understatement. When a day includes both sweeping views of the Pacific and secluded redwood groves, it’s easy to be grateful to live here in the Bay Area. The only downside of the day was when I misstepped and twisted my ankle. That wouldn’t have been so bad if I didn’t have another mile and a half to go. Despite my whining, I survived and by the next day, my ankle was doing fine. Weather: Sunny, but with an ocean breeze and a bit chilly in the shaded areas. Highlights: Amazing views of the Pacific. Waterfalls. Lush redwood forest. Today Jeff, Ethan, Jane and I completed our first hike from the 2012 East Bay Regional Parks Trails Challenge. We went out to Point Pinole Regional Shoreline. We followed the Bay View Trail, then went down onto the beach and followed the shoreline all the way out to the point. Coming back we came back through the Woods Trail and spotted a number of bunkers, as well a few Monarch butterflies that are known to hang out in the woods during this time of the year. I never would have imagined such a great park tucked between Richmond and Pinole. The park was expansive and absent of crowds. My only complaint: The park is not far from the Richmond Rod & Gun Club and we spent much of the time listening to the sound of gunshots echoing. That made it a little hard to just relax and enjoy the beauty around us. I’d recommend checking out the shooting schedule before planning a trip. Weather: Yet another beautiful, Spring-like day. Highlights: Pilings from original pier that was used to load dynamite onto ships at the turn of last century. Monarch butterflies. Yesterday was lovely. Met my sister, Tracy, for lunch and then we walked the lakeside trail at the Lafayette Reservoir. The weather was beautiful, though both of us lamented the fact that it’s Winter and there has not seemed to be Winter weather. I suspect that come Spring, when we’ll be expecting the Spring-like weather, the Winter weather is going hit. After our walk, we went to visit our parents. All-in-all, a really nice and relaxing day. Highlights: Time to catch up with my sister. Today, we went looking for Claremont Canyon Regional Preserve. After reading about it, I was intrigued to learn of a regional park behind the Claremont Hotel. We followed the road up the hill and I was so distracted by discovering the environment above the hotel, I completely missed the turnoff to get to the park. We kept driving up hill on Claremont and made it up to Grizzly Peak before we confirmed we’d messed up. Coming back down the hill, we spotted turnout and the entrance to a firetrail and decided to park and start climbing. Once we were done and found a map, we discovered we were hiking on University of California land, rather than East Bay Regional Parks land, and we ended up on the Panoramic Ridge. We didn’t have too much time to explore, but we found some sweeping views of Oakland and spotted a number of trails worth exploring. On the way back down the hill, we did actually find the turn-off to Claremont Canyon. At some point, we’ll go back to where we intended to begin and see if we can make our way up to where we ended up. Weather: Beautiful day, you’d think it was spring. Highlights: Quiet, peaceful, no one around. All you could hear (besides our kids) was the creaking of the eucalyptus in the wind. Reminder of how easy it is to “get away” without even leaving town. On Saturday, during the break in our weekend storm, Ethan and I went out to Point Isabel in Richmond. Given all the rain on Friday night, I went looking for some place with a paved trail and Point Isabel seemed like a nice choice. Since the park sits right on the Bay, there was quite a breeze and my ears were cold. The park is a well known local dog park, so I was treated to a full hour of Ethan sharing why we should get a dog and what kind of dog we should get (yes, tactical error on my part). 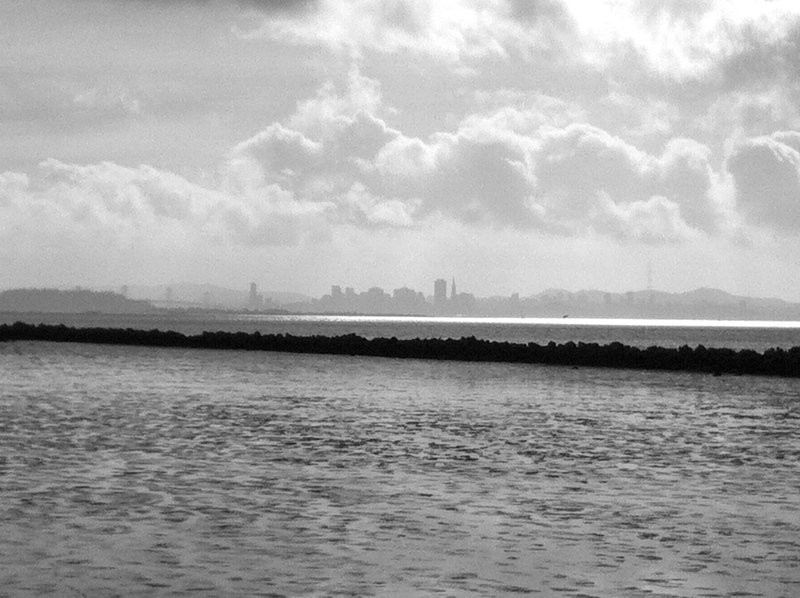 Running parallel to one of the trails is part of the San Francisco Bay Trail – so much more to explore. As part of my New Year’s Resolution, I’ve set a personal health goal of completing one new hike each week. My hope is that the hikes will not only infuse much lacking physical activity into my life, but also remind me how lucky I am to live in such a great part of the world (or at least appreciate wherever I am traveling in a given week!). To keep me honest, I plan to share my walks here. Today, Ethan, Jeff and I went up to Tilden Park (a 15 minute drive from my house) and walked the Quarry and Big Springs Trails. Highlights: Beautiful views, particularly of the San Francisco skyline and Golden Gate Bridge (see photo). We also spotted a bird of prey, likely a golden eagle.